Sometimes an outsider can see the flaws in your plan more clearly than you do. You know the guy. The one you sort of dismiss because he is small or quiet or has different ideas. That’s the guy (or girl) who might just be thinking out of the box. Shh! 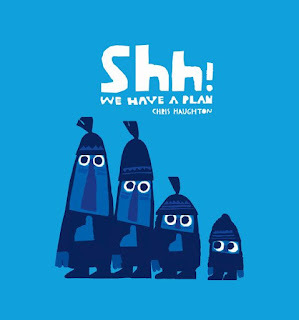 We Have a Plan, a picture book written and illustrated by Chris Haughton, is about three guys who have a plan and a fourth guy who clearly sees that their efforts are futile. All four of them are decked out in their best stealthy black gear. The three guys with the plan are each carrying a net. Their objective is to catch a pretty red bird perched on a branch jutting from the ground. The fourth guy, the small one, has no net and just seems to be tagging along looking skeptical. The three guys with the plan are pretty sure they understand the situation much better than the small guy. They don’t quite see the flaw in their plan. There are very few words in this story. Most of the the story is told through inference from the illustrations. The small guy’s methods meet with much more success that the three smart guys, but they don’t seem to see it. They keep repeating the same mistakes. The juxtaposition of the the smart guys’ actions with the small guy’s actions create the comedy in the story. The reader sees the proceedings through the eyes of the small guy who knows a whole lot more than he says. He doesn’t feel the need to capture the bird in a net. He really just seems to want to be friends with it. He might even have a cunning plan of his own to help the bird and thwart his companions. Do they finally get the message? The look on small guy’s face on the last page tells it all.